To say that Giant Pandas are totally adorable is probably one of the least controversial statements you can make, I mean, just look them here and here. But if you are a fan of giant pandas, then today's parasite is public enemy number one. 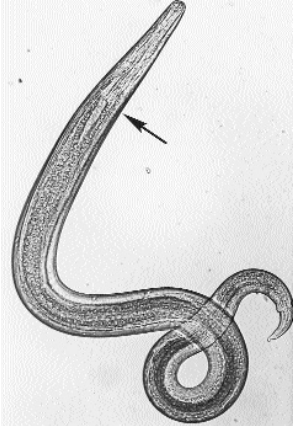 Baylisascaris schroederi is a species of parasitic roundworm that live as adults in the intestine of giant pandas, and in large numbers, they can form bowel obstruction and other more serious diseases. The adult B. schroederi produce eggs which leave the host along with panda faeces. When the panda accidentally ingest the eggs, they hatch into larvae in the intestine and proceed to burrow through various bodily tissues, causing inflammation and scarring in the the intestinal wall, liver and lungs. After a coming-of-age trip through the panda's various organs, the larvae return to the small intestine to grow up into an adult and get on with the business of being a grown-up parasite - laying lots of eggs. The eggs are really hardy and can stay viable in wet soil for many years, waiting for an unlucky panda to swallow them. Because B. schroederi can stay viable, a panda can get repeated infected by parasite larvae, inflicting internal damage for years. Baylisacaris schroederi is actually one of the leading cause of death in giant pandas, and depending on the region, half or even all of the pandas in a given population might be infected. To find out more about the ecology of these parasites, a team of scientists from China used a range of mitochondrial DNA markers to work out the population structure of B. schroederi. They collected adult B. schroederi found in giant pandas from ten geographical regions at three different mountain range in southern central China - Qinling, Minshan, and Qionglai. They found that despite the geographic isolation of those mountain ranges, the gene pool of this parasite is fairly homogenise, indicating that somehow despite their isolation, cross-breeding is occurring between the parasite populations. Perhaps some pandas are visiting neighbouring mountain range and end up picking up worms and dropping off B. schroederi eggs while they were there. Or it might not be the pandas themselves that are moving around - seeing as the eggs can survive for years in wet soil, they may get transported through other means. While the scientists found that the parasite population in Minshan has the highest level of genetic diversity, as a whole, B. schroederi has relatively low genetic diversity compared with other organism. But that is common feature with other roundworms in its family - the Ascarididae (of which the most well known species is Ascaris suum - the large pig roundworm) - regardless of their population size or geographical distribution. Currently there are no vaccines available for B. schroederi and the main way through which this parasite is being controlled is with anthelminthic drugs. Despite their relative low genetic diversity, this has not stopped some populations from evolving drug resistance. That is why it is important for us to understand this parasite's population genetics - because if there is cross-breeding occurring, then the gene(s) for drug resistance can spread very quickly across the different population and pose a threat to the endangered giant panda. Xie, Y. et al. (2014). Absence of genetic structure in Baylisascaris schroederi populations, a giant panda parasite, determined by mitochondrial sequencing. Parasites & Vectors 7: 1591. Most people usually think of copepods as tiny crustaceans which live as zooplankton near the, and for most part that is true. But it might be a surprise to some of you that over a third of all known copepods are actually parasitic and they live on/in all kinds of aquatic animals. One particularly successful family of such copepods is the Pennelidae - not that you would necessarily recognise them as crustacean if you are to ever see one. While most species in this family live on fish, the parasite that we are featuring today has evolved to be a bit different. Instead of infecting fish, it has managed to colonised aquatic mammals - specifically cetaceans (whales). Whales are among the largest known animals to have ever lived, and P. balaenopterae also happens to be the largest known copepod (most free-living copepod are tiny zooplankton measuring a few millimetres in length). As its name indicates, this parasite was initially found on baleen whales, such as fin whales, but it has been reported from different species of toothed whales as well. Despite being known to science since the 19th century, there is very little information about the biology of this peculiar parasite. 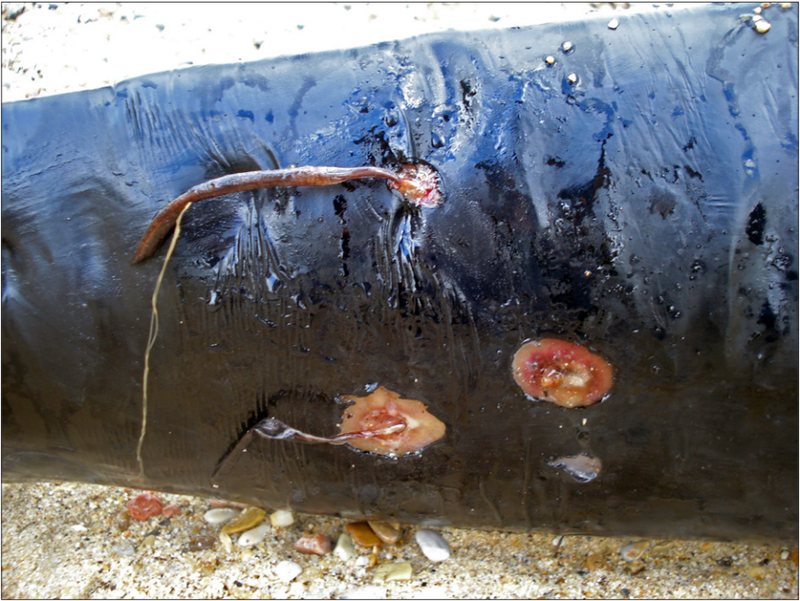 The paper we are featuring today reports this parasite infecting harbour porpoises (Phocoena phocoena relicta) in the Aegean Sea. These parasites each measured over 10 centimetres long and most of it is buried deep in the blubber. In this study, Pennella balaenopterae were mostly found on the porpoises' back and abdominal area, probably because those areas are rich in easily accessible blood vessels that the parasite can tap into. Even though technically it is an ectoparasite (external parasite) as it can be found dangling on the host's external surface, a significant portion of its body is actually deeply buried in the porpoises' tissue (not unlike the shark-infecting barnacle Anelasma squalicola which was featured last year). Hence some parasitologists call them "mesoparasites"; they are not strictly internal parasites (endoparasites) such as many parasitic worms, but they do interact with the host's internal tissues in some major waya. Species like P. balaenopterae shows that over evolutionary time, some parasites can make rather radical shifts in their preferred host if given the opportunity to do so. Last year I wrote about an elephant blood fluke which has colonised rhinos because both of its mammalian host share the same habitat. Indeed, both whales and fish that are infected other pennelid copepods are both marine animals, so there have been many opportunity for such a host jump to occur. However, it is one thing to jump from one large, terrestrial mammal into another, it is quite another to branch off and infect an entirely different class of animal which has a very different anatomy and physiology to the ancestral host. More studies will be needed to find out what makes P. balaenopterae different from its related species, as well as when and how it made the leap from living on scale-covered bony fishes, to burying themselves in the tissue of air-breathing blubbery whales. Danyer, E., Tonay, A. M., Aytemiz, I., Dede, A., Yildirim, F., & Gurel, A. (2014) First report of infestation by a parasitic copepod (Pennella balaenopterae) in a harbour porpoise (Phocoena phocoena) from the Aegean Sea: a case report. Veterinarni Medicina, 59: 403-407.